It can be hard to find good tea at a reasonable price in London, especially near tourist hotspots. Hard enough that when somewhere comes along offering good, honest tea at a decent price, with friendly service and all within a stone's throw of one of the most popular attraction in the city, it has to be worth a mention. Walk down from the London Eye and cross the road, and you're there, at the oddly-named Elephant To Feed An Elephant. It's a big place, nicely furnished with an assortment of old, wooden tables and chairs (most equipped with Chelsea clips - this is London, after all). Slightly bizarrely, but nonetheless endearingly, one wing of the café is kitted out like an old Tube train, complete with vintage Tube seats, and line maps and mirrors (to suggest windows) above each seat. It's surprisingly effective (as I hope the poorly lit photo on the left shows) and I bet overseas tourists love it. What of the tea then? Well, all the prerequisites are in place: a proper cup, tea in a pot, real milk. And there's variety too, with fruit teas, decaff and a choice of black teas on offer. Should something be wrong with you, and you want something other than tea to drink, well, you're well catered for too, with various coffees, hot chocolate and more cold drinks than you can shake a stick at. Then there's the food. As you would expect from an establishment with this name, the menu is vast. It's also fairly basic, in that fry-ups, jacket potatoes, pizza and pasta are all on offer. 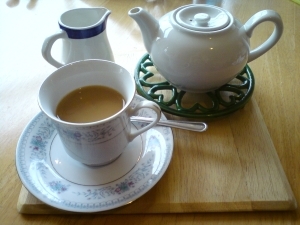 But here at Great Tea Towers, we don't mind a bit of basic, as long as it's honestly priced and served with a smile. Which it is, here. There's a nice range of cakes too - the cherry muffin was a particularly good accompaniment for my cuppa. I'll be honest, when I first saw Enough To Feed... I didn't expect too much, but it was cold and wet and I needed warming up. How pleasantly surprised I was. Yes, I know it's south of the river, but as I've already said it's right next to the London Eye, so very handy for lots and lots of people. Right across the road from the highly-recommended London Duck Tours start point too, and only a hundred yards or so from Waterloo station. It's good tea, in a central location, that won't cost the earth and isn't Starbucks. Really, what more do you want? I know, it really doesn't look like much from the road, does it? It looks a bit better from the beach, as you might expect, but even then the Midbay Café is just a humble caff in a line of more elaborate looking hotels, restaurants and dining opportunities. So yes, it's a bit basic... but don't let that put you off. This is a step up from your average beach caff. Being a beach-front café (let's dispense with talk of caffs, somehow it seems inappropriate for Jersey), there are, as you would expect, a decent number of tables to sit outside and, despite the fact that Midbay is far from the largest eatery on the promenade (I'm trying to avoid saying it's relatively small), good use is made of interior space. 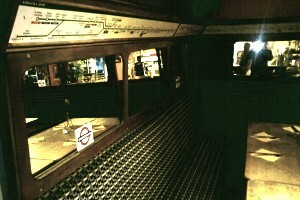 There's plenty of seating, whilst stopping short of cramming tables in to the point of claustrophobia. As is the case with many of the teashops here on Great Tea, there are plenty of food options too. In addition to the usual cakes and pastries, Midbay offers a decent array of fairly-priced hot meals. It's not going to be winning any Michelin stars but that's not what this website is about - what you'll get is decent portions of honest food, and you can wash it down with a cup of truly excellent Cooper's tea. 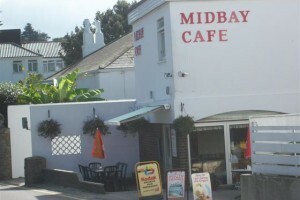 All in all then, there may be plenty of classier looking joints along the seafront at St Brelade, but if you want a decent cuppa in honest surroundings at a fair price, Midbay is the place to go. Biddy's Tea Room has a trump card to play, and it plays it at every opportunity, that card being the vintage theme. Everything is vintage. The decor. The artfully mismatched crockery. The seemingly random but probably carefully chosen selection of chairs. Everything is designed to say "this is a vintage tea room, the like of which you may remember from rose-tinted nostalgic memories of yesteryear." And you know what? It works. Despite bordering on the quaint, Biddy's is both cool and cosy, a genuinely nice place to hang out, and relaxing too - the wilfully bygone atmosphere somehow makes you want to linger longer over your tea. That can only be a good thing. And speaking of tea, as we always are, what an array they have here: everyday, decaff, lapsang souchong, Earl Grey, Lady Grey, rose garden, green tea, English breakfast, Darjeeling, peppermint, camomile, white tea, and more fruit teas than you can shake a stick at. You can ask for lemon or soya milk with your tea too, if either of those takes your fancy - a nice touch. Despite a varied menu, I am (naturally) going to recommend a cake to go with you tea - there's a wide selection that varies, including some from the delicious Half Moon. But if you're on a diet, there's a wide range of finger sandwiches too... or why not combine the two? 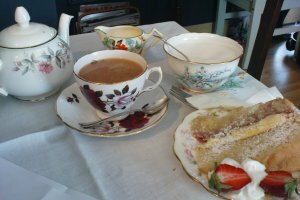 Biddy's do a proper afternoon tea on a tiered plate, in sizes for one, couples or groups. Also on the menu, you'll find ploughman's lunches, soups and pancakes, sweet and savoury. Spolit for choice really. The vintage atmosphere is further ramped up by the piped music from the 1920s - 1940s. Oh, and when I visited there was a lovely big Union Jack hanging from the ceiling, although whether that's a permanent feature or just there for the royal wedding, who knows? I have to point out a slight access issue - Biddy's is upstairs above a trendy shop, and is reached via quite wide but also quite steep stairs. Those with pushchairs, buggies, wheelchairs or the like may need to think twice. Hopefully it won't stop you though - Biddy's is a quintessentially British tea room, unashamedly wallowing in nostalgia, and we should applaud and relish it in equal measure.